You will need: scraps of colored paper, glue, and large sheets of plain paper. Using scraps of paper, tear each piece and glue in place on the background sheet. Use your thumbnail to take small bites out of the paper. It is a good idea to always start with a large piece of paper and tear down to the size you need. Don’t worry about small details in the picture. You don’t need them for this kind of art. The more pictures you make, the better you will become at making them. You will need: a large corrugated cardboard box, masking tape, chocolate or shoe box, and glue. Remove flaps and bottom of cardboard box. Cut box down one corner seam and place corrugated cardboard in one long sheet. Measure cardboard 29 inches wide and trim to fit that width. Make one fold three inches from end. Mark for folds at 11 inches, 22 inches, and 33 inches. Cut off extra cardboard at 36 inches. Fold the cardboard into a triangle, tucking the three inches left over inside the top fold. Glue together and when totally dry place masking tape along the top cut edge. Also use masking tape to cover side cut edges (see illustration). Cut hole to fit can or jar in lid of chocolate or shoe box. Place can inside the hole. This will be a good place to keep water to rinse brushes. When through painting, wash brushes carefully. Empty water from can or jar and place clean brushes with brush end up in the can for storage. You will need: tacks, two pieces of 9-by-12-inch felt, small scraps of felt, and a needle and thread or glue. Place one piece of felt three inches from the top of second piece of felt (see illustration). Sew or glue these two pieces together along the lower edge of the bottom piece. Now fold up the three inches of felt (see illustration). Sew these three layers of felt together on the ends and also in the middle to make the pockets as shown. Use scraps of felt to decorate the pockets. (Flowers, letters, numbers, or silhouettes of items to represent those items that may be placed in each pocket, such as coins, pencils, paper, stamps, paper clips, or others may be used.) Messages, reminders, and other notes can be pinned to felt. You will need: pictures from magazines, photographs, or pictures you have colored or painted, thin cardboard, glue, pencil, and scissors. Glue picture to cardboard. Be sure to place picture down carefully so there are no bubbles between cardboard and picture. When glue is completely dry, turn picture over and draw the outlines of a jigsaw puzzle on back of cardboard. Cut on these lines. Place puzzle pieces in a box that you have decorated. You will need: a white round ice cream carton or white cardboard paint bucket, wire clothes hanger or other stiff wire or cord or rope for handle, poster paint or pictures cut from old Christmas cards, glue, cellophane or see-through wrap, and ribbon. Attach handle to top of bucket. If you use wire, you might cover it with yarn or colored string wrapped tightly around the wire. Paste Christmas pictures or paint decorations on side of bucket. Fill bucket with popcorn balls, candy, cookies, fruit, or other Christmas treats. Cover them with cellophane or see-through wrap and tie with a ribbon in a bow. You will need: 20 marshmallows, 2 tablespoons vegetable shortening, 4 drops red food coloring, and six cups popped unbuttered unsalted popcorn. Place marshmallows in top of double boiler over boiling water. When marshmallows are melted, stir in shortening and food coloring. Then stir in popped corn. Red cinnamon candies and raisins may be used for nose, eyes, and mouth. Place popcorn children aside when finished so that they will cool and become firm. You will need: one washcloth for each puppet, buttons, scraps of felt or material, and embroidery thread. Bring corner D to corner B as shown in illustration and stitch along edge from A to C. Fold corner E to corner D as shown in illustration and stitch along edge from B to C. With D and E together, stitch along edge from C to D and E. Turn over so this seam is on the bottom. Stitch one inch across at F as shown. Turn puppet to right side and push the stitched ends out to form ears. Sew buttons in place for eyes. Embroider mouth, nose, and whiskers as needed to finish the face. You will need: a rubber or tennis ball, old or new socks (men’s size), yarn, embroidery thread, sewing needle, and scraps of felt. Fit the ball snugly into the toe of the sock. Allow one-fourth inch for seam and cut rest of material away from the ball. Sew the edges together, being sure to tuck the raw edges inside the seam. The seam should be smooth and the sock should fit snugly around the ball. Sew on button eyes. Embroider the nose, mouth, and whiskers. Stitch loops of yarn all over the ball, leaving a round face for lion. You will need: a rubber or tennis ball, old or new socks (men’s size), buttons, scraps of felt or material, yarn, embroidery thread, sewing needle, and ribbon. Sew on button eyes. Embroider a smiling mouth, nose, and eyebrows. Make a cone-shaped hat from felt or other scrap material. Sew the hat to the ball. Yarn may be sewed along edges of hat to resemble hair. Tie a ribbon into a bow and sew in place under the chin. You will need: old baby blankets or good portions of worn blankets, one yard grosgrain ribbon, fringe, tassels, or other trim. Cut a half circle 30 1/2 inches in diameter. Fold the straight edge over to make a one-inch seam and casing for the ribbon. Sew. Make two cuts in casing, one three inches from each edge. Attach large safety pin to one end of ribbon and push through from one opening to the other. This makes the tie to hold the scarf on your head. Trim the rounded outer edge with ball fringe, tassels, or other trim. You will need: matchboxes, glue, metal brad fasteners, adhesive-backed paper or construction paper or wallpaper, and poster paint. Save matchboxes until you have several. Stack the boxes in the shape you want and glue together. Insert one metal brad fastener in the end of each box with the prongs spread open on the inside. These brads make the drawer pulls. Cover the outside of the matchboxes with adhesive-backed paper, wallpaper, or poster paint. These chests will hold doll shoes and other accessories. You will need: one-half bath towel, plastic hoop with open ends (see illustration), and ribbons or scraps of material. Fold the cut edge over one and one-half inches to make casing for the plastic hoop, and sew down. Fold up bottom of towel (the finished edge) six inches. 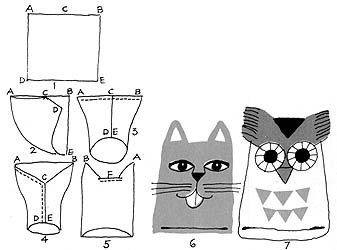 Stitch as shown to make three pockets. Decorate apron with ribbons or other decorations. Push hoop through casing, and apron is ready to wear.